On the afternoon of 22 January 1879, two survivors from Isandlwana – Lieutenant Adendorff of the 1st/3rd NNC along with a trooper from the Natal Carbineers – arrived at Rorke's Drift bearing news of the shocking defeat and destruction of the British Army at Isandlwana. They carried with them one other bit of information of importance to the garrison at Rorke's Drift. A part of the Zulu impi, some 3000 to 4000 strong, was now headed directly their way. Upon hearing the news, Chard, Bromhead, and Acting Assistant Commissary James Dalton had to make a quick decision. 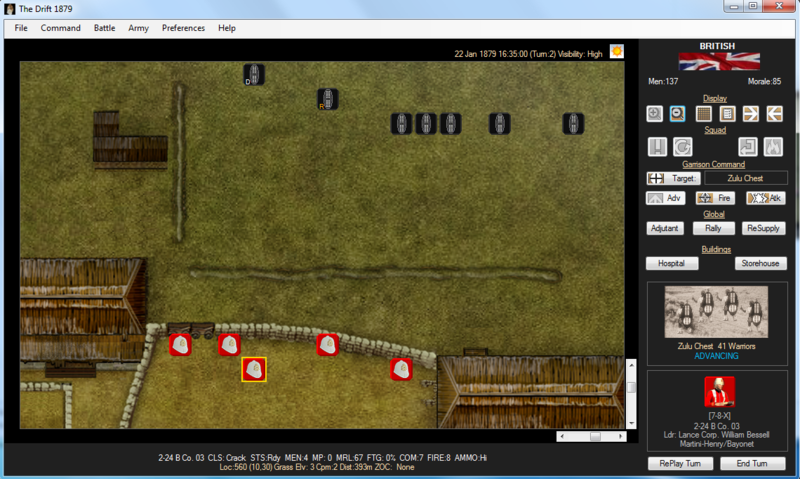 Attempt a retreat to Helpmekaar or defend their tenuous position at the Drift. Dalton pointed out that a small column, traveling in open terrain, burdened with carts full of wounded and ailing, would be easily overtaken and defeated by the numerically superior Zulu force. The only acceptable course was to stand their ground and fight. Under the command of Lieutenant John Chard of the Royal Engineers, the Battle of Rorke's Drift immediately followed the British Army's staggering defeat at the hands of the Zulu at Isandlwana earlier in the day. 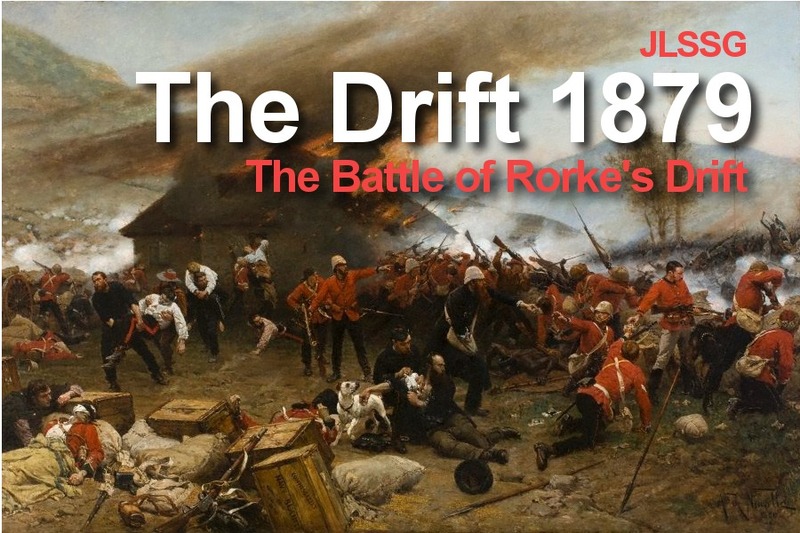 The defense of Rorke's Drift stands out as one of the most courageous actions in military history. With eleven Victoria Crosses awarded, its legend remains part of British military heritage to this day. The Drift 1879 is designed to be a fast user friendly turn based game. Players may perform any available action at any time during their turn segment's movement/combat phase. The British begin the game with the initiative (turn segment) and must first place the garrison's defenders in position before the impending Zulu assault. The Drift 1879 uses a variable distance scale of 30 meters per grid cell outside the fort and 3 meters inside. 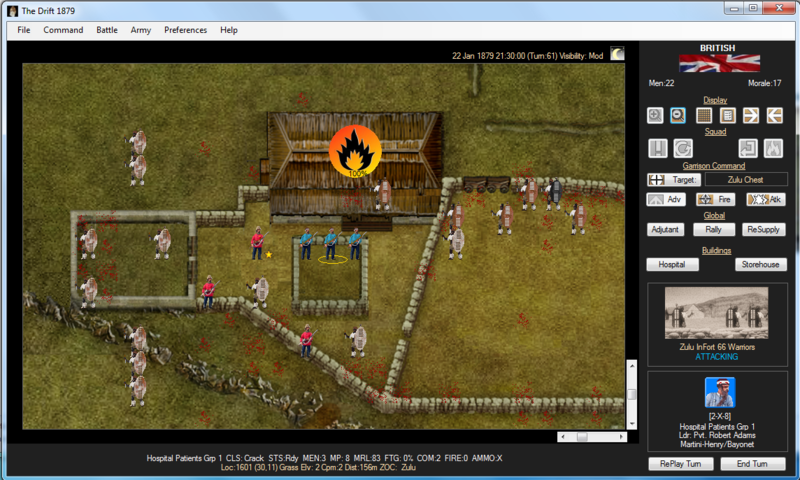 This allows players to uniquely experience the different flavors and characteristics of the engagement, from the initial stage crossing the open fields to the perimeter and the desperate hand-to-hand fighting inside. 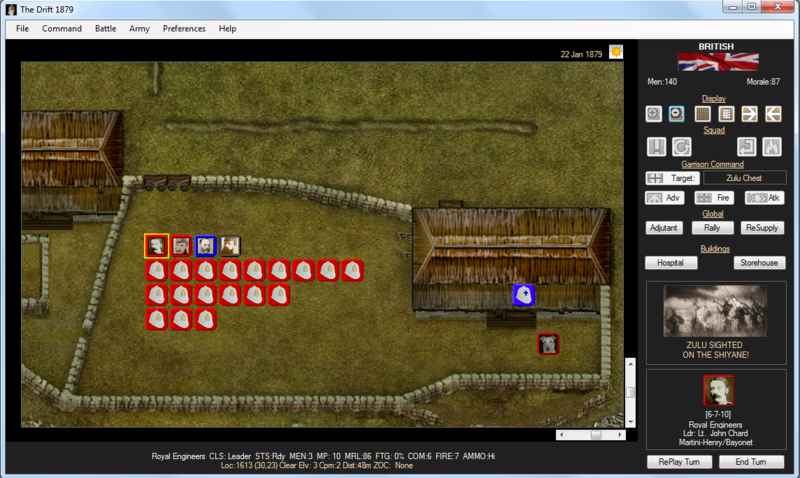 Units are comprised of 3-6 men, with each turn spanning about 5 minutes of battle. Critical human characteristics, such as morale, leaders, command and control, and fatigue. Historical weapons effects, from rifles, muskets, bayonets, iklwa and assegai (spears). Fog of War and night effects. Special circumstances, such as the ability to set buildings ablaze, or evacuate medical patients/wounded. An AI 'Adjutant' capable of issuing orders for the human player, plus the ability to give Standing Orders settings (SOP's) which direct the AI how to act in the absense of specific orders. 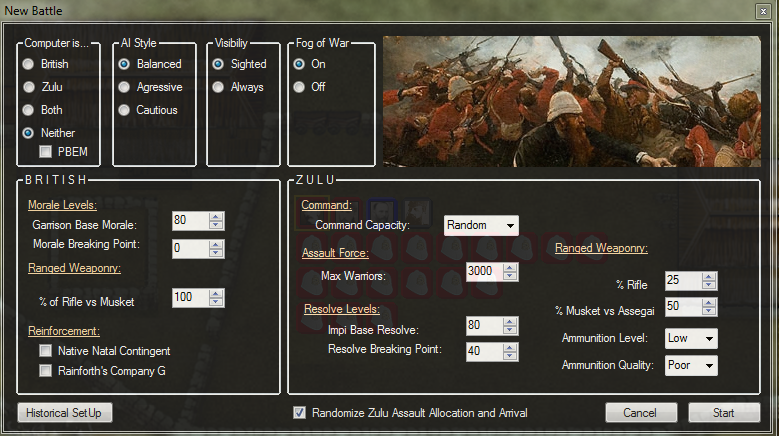 Different Zulu force size, allocation, and command capacity. The arrival of British reinforcements (Stephenson's Native Natal Contingent, Rainforth's Company G). 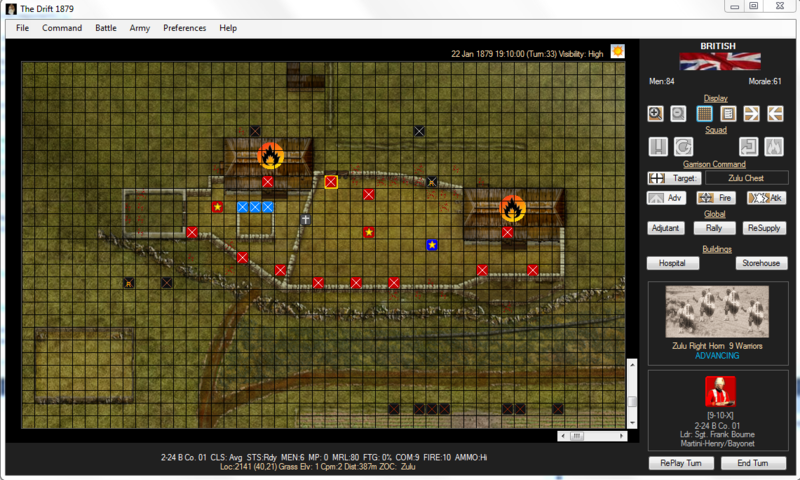 Variations in force morale/resolve base levels and breaking points. Allocation of different types of arms, munition levels and quality. The game also includes an option for randomized battles; if the hisorical one isn't nail biting enough. Click here for an detailed and exciting Game After Action Report on SugarFreeGamer.com. Click here to read a min-review by James Durney.